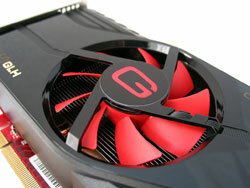 Another GTX 460 makes its way to our test bench today. 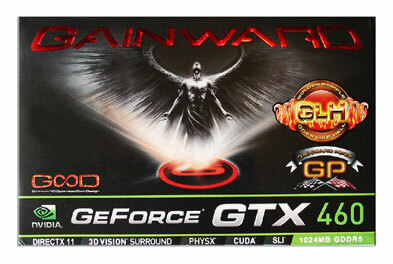 This time it's Gainward's fastest GTX 460 1GB; the Gainward GTX 460 1GB GS-GLH, where GS-GLH stands for "Golden Sample - Goes Like Hell". In this review we run it through the usual barrage of tests and overclocking, while comparing it to some similarly priced products from the red camp. 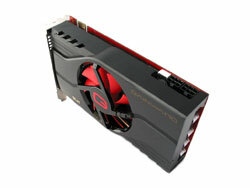 This card measures in at 187 mm in length and requires a minimum of 450W or greater system power supply. 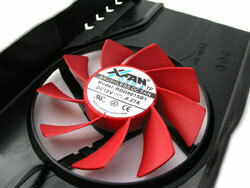 Cooling is provided by an 8cm RPM controlled fan in combination with a aluminium fin array and a dual heatpipe design. And as with all cards in NVIDIA's mainstream to high end 400-series segment it features support for NVIDIA's SLI multi-GPU technology, 3D Vision, 3D Vision Surround, PhysX acceleration, Microsoft's DirectX 11 game support as well as a variety of video enhancement technologies under the NVIDIA PureVideo umbrella. Inside the box we find a quick start manual and a software/driver disc for installation. One PCI-Express 6-pin to Molex power connector is present, as well as a Super LoiLoScope 25% off discount voucher, which is a video encoding/editing application that makes the most of NVIDIA's CUDA acceleration; overall a fairly typical package. 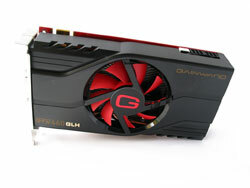 Gainward's GTX 460 strays away from NVIDIA reference designs we've seen in the past. In this version they've removed the mini-HDMI connector in favour of a full sized connection (still version 1.4a), and included a native VGA port instead of using an adapter. 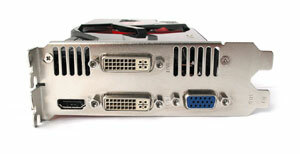 Two dual-link DVI outputs are also present. As with all GTX 460's it features enhanced audio support over HDMI, this includes bitstreaming support for both Dolby True HD and DTS-HD Master Audio over HDMI with the supporting software packages. 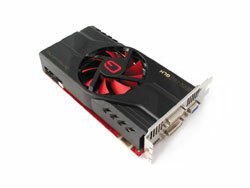 On the edge of the card we find a single SLI connector; due to the mainstream nature of this card NVIDIA has limited its scaling abilities to two cards. 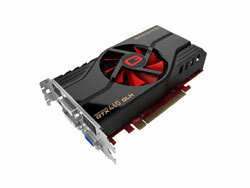 Only the GTX 465, 470, 480 and 580 allow for more than two cards in SLI. 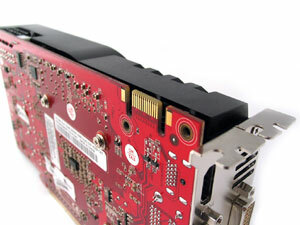 At the top of the card we find a pair of PCI-Express 6-pin power connectors, which is a pretty standard configuration for a GTX 460 video card; not straying from the NVIDIA reference design power-wise. 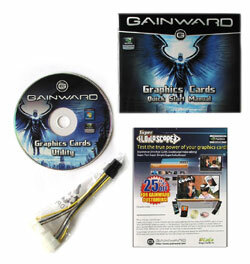 The Gainward GTX 460 GS-GLH features Samsung K4G10325FE-HC05 GDDR5 memory which is rated at 1000 MHz (4000 MHz effective). With the default memory clock set at 1000 MHz it's already at its optimal working specification. The fan utilised in this design is by Xinruilian Science & Technology. It's rated at 0.27A, uses a ball bearing design and has a 4100 RPM maximum with a 49.6 CFM air flow rating at full speed. During idle the fan functions at a steady 40%, and then once over ~70 degrees Celsius it ramps up in smaller percentage increments based on the temperature readings. 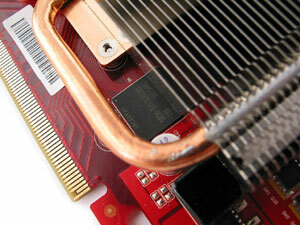 Removing the plastic shell exposes the heatsink design employed by Gainward's engineers. The design consists of a copper base and dual heatpipe design connected to an array of aluminium fins to help dissipate heat transferred from the GPU. 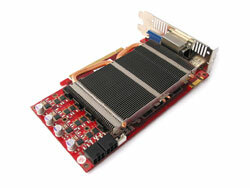 No other heatsinks are present on memory or electrical delivery components.